Aeslynn was born on a special day...the dragon lord who protects her town grows to love her...but when dreams and a nobleman get in the way, what's Aeslynn and Lonryo to do? This book took me by complete surprise! 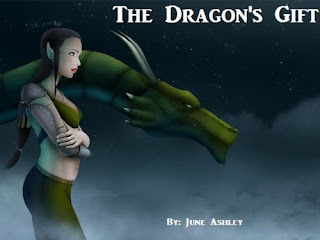 The Dragon's Gift by June Ashley follows the life of Aeslynn, a girl born on the day of the offering. When the dragon lord, Lonryo, first lays eyes on her, they immediately form an unfathomable connection. Aeslynn is a great character. I absolutely loved her innocence, her ability to love and forgive, and the loyalty she felt towards the important people in her life. Ashley does a great job at bringing the reader into the world of fantasy she created. Readers will have a connection with Aeslynn based on how she treats other characters throughout the novel. She's the kind of character that you want to be your best friend. The plot of The Dragon's Gift revolves around Lonryo and Aeslynn's connection. As Aeslynn grows older her bond with Lonryo deepens and she falls in love with him, though this is unheard of in dragon history. Then Aeslynn's dreams turn to nightmares and she prays that they don't manifest to ruin her happiness. As I previously said, this book took me by complete surprise and I am so glad that I read it. The only problematic thing for me were the time lapses in the novel. Throughout the novel, as the chapters changed, large periods of time would be skipped. I felt as if I was missing out on some of the story. Though overall I loved this book, I wanted to know more about Aeslynn and see her grow up rather than skipping the dull moments. However, the book would have probably been spread out into a series. Regardless, The Dragon's Gift is recommended for an enjoyable read.